Neale Daniher has become just the fourth recipient of the John Kennedy Lifetime Achievement Award. 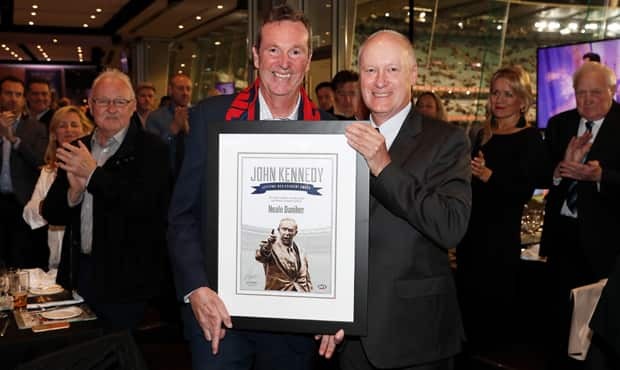 Essendon Football Club is proud to celebrate club legend Neale Daniher after he was awarded the John Kennedy Lifetime Achievement Award by the AFL at the MCG on Friday. The award recognises those who have made an extraordinary and positive contribution to the game of Australian Football across multiple parts of the game, something Daniher has done in spades as a player, coach and administrator. Daniher is just the fourth recipient of the award, joining the late Lou Richards, Dr Allen Aylett and Bob Hammond. Daniher was one of the league’s greatest talents, but his playing career was sadly curtailed by a series of significant knee injuries. He won Essendon’s best and fairest in 1981 and captained the club in 1982, but was ultimately restricted to just 82 games, retiring in 1990. But that was never going to stop Daniher from being a part of the game. He became an assistant coach with the Bombers before moving across to briefly join Fremantle and then making his coaching name at Melbourne. It was with the Demons – where he coached 223 games – that Daniher led his side to the 2000 Grand Final against Essendon. After coaching, Daniher moved into administration at West Coast, working through to 2013. Just a year later, he revealed he was diagnosed with Motor Neuron Disease (MND) and immediately looked forward at what he could do to find effective treatments and a cure for the disease. Daniher founded FightMND – which leads the way by funding clinical trials, research projects and drug screening – and the organisation has now raised more than $35 million under his relentless leadership. AFL Commission Chairman Richard Goyder praised Daniher for his contribution to the sport and the broader community. “Neale made an immense contribution to our game as a player, coach and administrator across more than three decades, playing, coaching and working at elite level on both sides of the country,” Goyder said. “Since he was diagnosed with illness, he has continued to work and lead and Neale has found a way to unite the football community in a manner that has rarely been seen. “The impact of the Big Freeze at the G has been inspiring and fans across the country have responded by supporting the fight against MND in any way they can.